We have a busy, recreation-based, Royal City Rag planned for CFRU 99.3fm this Saturday morning, November 13 between 8-10 a.m. In the first hour, we’ll be talking to Jack Frimeth about the Reel Paddling Film Festival. The Centre Wellington DHS Aboriginal Program presents the 5th Annual Reel Paddling Film Festival at the E.L. Fox Auditorium (JF Ross CVI), 22 Meyer Dr., on Saturday, November 13, 2010 at 7.30 p.m. (doors open at 7 p.m). Tickets: Advance from the Bookshelf – $10/ Door – $15. With 37 inspiring paddling films short-listed for the World Tour, including the nine festival category winners, audiences can expect to see hairy whitewater action, sea kayakers exploring remote coastlines, coast-to-coast canoe expeditions, international river travel films, motivating environmental documentaries, grueling kayak fishing battles and hilarious short films capturing the lighter side of paddling life. The Guelph show will also include a segment devoted to family paddling as well as an hour long environmental segment focusing on waterways that are soon to be dammed. Later in the hour, Carin Headrick from Guelph Barrier Free Committees will be joining us again with an update on the activities of the accessibility focused committee. One of their current projects is to find out what recreational activities are available to help people with disabilities participate in recreationwithin the community. Since the focus of the committees is activities that are not run by the city, they are interested in recreation provided by gyms, churches and clubs, etc. They plan to survey people with disabilities to find out what recreational activities they would like to get involved in. Are you looking for sledge hockey? What about wheelchair basketball, Goalball or curling? They are also interested in knowing what barriers people with disabilities have encountered in participating in sports and other recreational activities. Feedback can be sent to headrick2001@rogers.com. In the second hour, we’ll be discussing the first Guelph Contemporary Dance Festival‘s first performance of the season, a free one-hour performance on November 16, 2010 at 12.00 noon in the University Centre courtyard at the University of Guelph featuring Toronto’s Company Blonde. Company Blonde specializes in creating dance works that are accessible to audiences of all ages blending comedy and theatre with classical modern dance. Company Blonde strives to tell stories and share experiences that speak to our community and our culture, while always keeping the audience at the forefront of their work. To wrap up the show, we’ll have a studio visit from singer-songwriter Kevin Morse and storyteller Brad Woods. Kevin has a CD release show at The Roxy in Acton on November 27 that will also feature some stories from Brad. 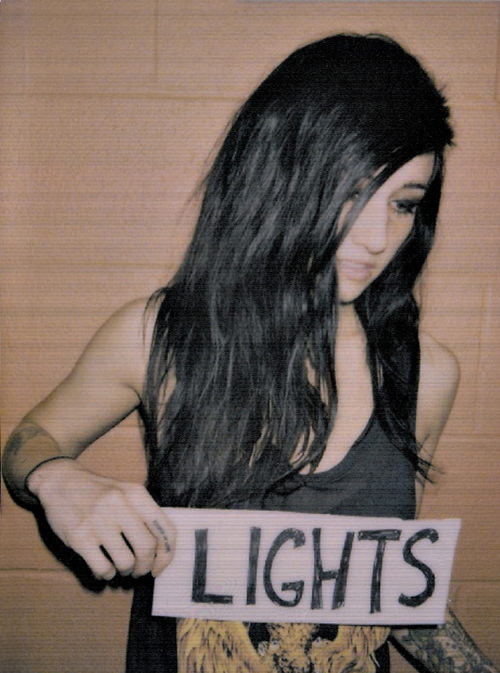 And, as a special treat… we’ll also be giving away 3-pairs of tickets to twenty-two year-old Toronto singer and multi-instrumentalist Lights‘ all-ages show (with Windsor based folk-pop act Michou), at Cowboys Bar. 166 Wyndham St in Guelph on November 26. Phew! Promises to be a great show. You won’t want to miss it! Royal City Rag, Saturdays 8-10 a.m. on CFRU93.3fm in Guelph. Remember if you don’t catch Royal City Rag live, you can always pick it up later that day via the CFRU archive or here, on the blog, a day or so later. Royal City Rag on May 29 was our last 7.00 a.m. start before we move to our new, more-civilised 8-10 a.m. Saturday slot. In the first hour we were joined by our good friends Chris and Sally from Transition Guelph. Among other things, we chatted about Canadian Environment Week (May 30 – June 5), Saturday’s ecomarket at Stone Road Mall and the Council of Canadians special townhall style meeting on Growth, Gravel and Groundwater and the threats facing our community that takes place at Harcourt Memorial United Church, 87 Dean Ave, Guelph, ON on June 3 a 7 p.m.
An expert panel featuring members from Gravel Watch, Grand River Environmental Network, FORCE (Friends of Rural Communities and the Environment), CARRA (Cranberry Area Ratepayers and Residents Association), North Dufferin Agriculture and Community Taskforce (opposing the giant quarry above Luther Marsh, at the top of Grand River headwaters) as well as local hydrologist Hugh Whiteley will discuss the impact of quarries, pipelines, roads and new development on the future sustainability of both our city and the Grand River watershed. In the second hour, Royal City Rag Culture Vulture Daniel Poulin returned to the show to discuss the upcoming Guelph Contemporary Dance Festival. This year the festival runs from June 3-6 at locations throughout our lovely city. On the Stage A, B & C (formerly the Main Stage Series) and Youth Moves will be held at the River Run Centre. In the Park (formerly the Site-Specific Series) will be taking place at Exhibition Park and On the Street (formerly the Noon-time Series) in St. George’s Square. The four days of dance will feature youth performers, local artists as well as acclaimed national performers from across Canada. In the third hour (9-10 a.m.) we were pleased to welcome Jay Lefler, co-founder of Spark of Brilliance into the studio. Spark of Brilliance is a community-based initiative that promotes healing and recovery for people coping with mental health challenges. Creative art programs and services are designed to enhance quality of life for participants, inspire independent thinking and grow self-esteem. Spark programs empower individuals and families with the skills they need help make meaningful contributions to their community. Spark of Brilliance is bringing the work of four talented artists to Guelph community space, 10 Carden in an exhibition entitled “Power To The Arts”. This exhibition will demonstrate a broad range of artistic expressions in oil, ink, collage, mosaic, and mixed media. Artists Barb Cohen, Lisa Cosier, Marcey Gray and Jay Lefler hope to raise awareness of how their personal experiences with mental health issues have been overcome. They also want the community to understand how recovery can happen through connecting with the creative spirit. 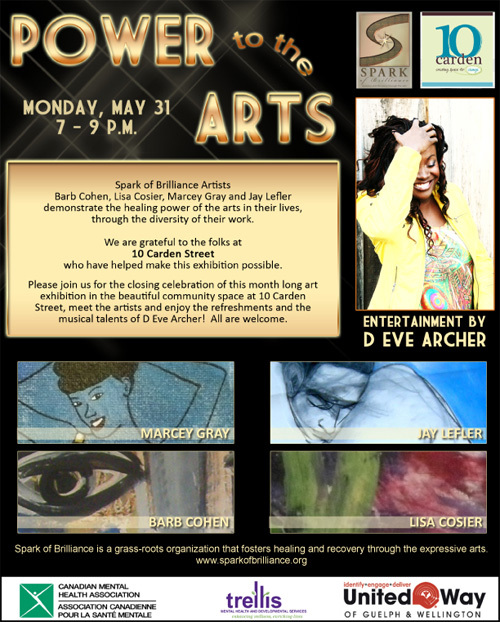 This special event takes place on Monday, May 31 from 7 to 9 p.m. Local singer-songwriter D Eve Archer will entertain and refreshments will be served. We have a 3-hour Royal City rag planned for May 29. This will be our last show starting at 7.00 a.m. before we move to our new, more-civilised 8-10 a.m. Saturday slot. In the first hour we will be joined by our good friends Chris and Sally from Transition Guelph. 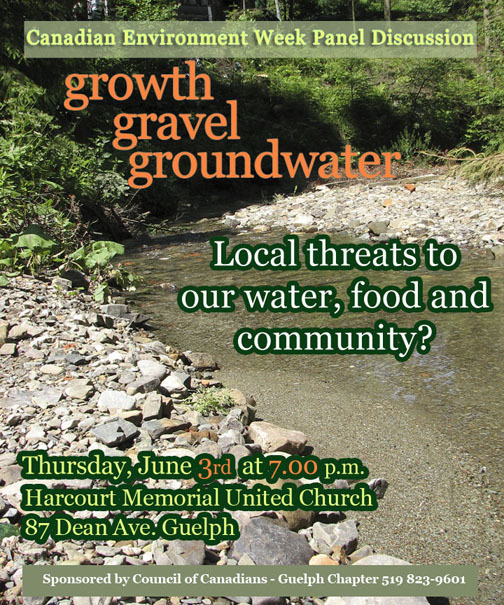 Among other things we’ll be chatting about Canadian Environment Week (May 30 – June 5), Saturday’s ecomarket at Stone Road Mall and the Council of Canadians townhall meeting on Growth, Gravel and Groundwater and the threats facing our community that takes place at Harcourt Memorial United Church, 87 Dean Ave, Guelph, ON on June 3 a 7 p.m. 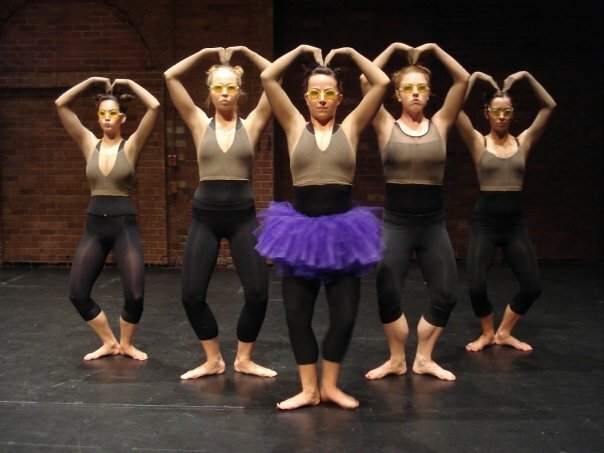 In the second hour, we’ll be reconvening the renowned Royal City Rag Culture Vultures when Marie Zimmerman and Daniel Poulin return to the show to discuss the upcoming Guelph Contemporary Dance Festival. In the third hour (9-10 a.m.) we will be welcoming Jay Lefler, co-founder of Spark of Brilliance into the studio. As always we’ll wrap the whole thing up with some great music. Should be fun. You won’t want to miss it! Royal City Rag, Saturdays 8-10 a.m. on CFRU93.3fm in Guelph. Remember if you don’t catch Royal City Rag live , you can always pick it up later that day via the CFRU archive or here, on the blog, a day or so later. In the first hour on May 8 we welcomed Rob Case from local non-profit organisation Guelph International Resource Centre (GIRC) back to the show. GIRC is celebrating its 30th anniversarythis year. GIRC’s mission is to increase community awareness of global issues, including their local aspects, while encouraging action to promote a just and sustainable future. For the past 10 years GIRC have been promoting the use of rain barrels to aid in water conservation. GIRC had their first Rain Barrel Sale of the season on Saturday at Planet Bean on Grange. They have another two sales planned for later this month; Saturday May 15 from 10. 00 a.m-1.00 p.m. at the West End Recreation Centre and Wednesday May 19 from 5.00-8.00 p.m. at the Stone Store, 14 Commercial Street, Guelph. Barrels for these sales are being assembled by volunteers from Parkwood Gardens Neighbourhood Group. Proceeds from the sales will support the services and events the neighbourhood group provides to its community, as well as the various non-profit initiatives of the Guelph International Resource Centre including the Guelph Festival of Moving Media taking place in November. GIRC rain barrels are durable, locally made from used food import barrels and available in three colours. They are easy to maintain, repair and customize. A 220 litre rain barrel is only $60 (while supplies last, Visa and Mastercard accepted). You can pre-order your rain barrels HERE. In the second hour of the show, our culture vulture, Marie Zimmerman (currently executive director of the Hillside Festival), was back in the studio for a relaxed chat about the arts focusing on three of the summer festivals the area has to offer; The Guelph Contemporary Dance Festival (June 3-6), Hillside Festival (July 23-25) and Eden Mills Writers Festival (September 19). We also had an apportunity to play some music from the headliners at this year’s Hillside. Check it out. 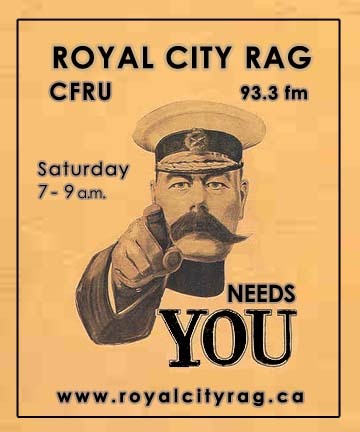 Royal City Rag will be back on CFRU 93.3fm this coming Saturday, May 8 from 7-9 a.m. In the first hour we will be welcoming Rob Case from Guelph International Resource Centre (GIRC) back to the show. GIRC have their first Rain Barrel Sale of the season, this Saturday May 8 from 10.00 a.m. – Noon at Planet Bean Cafe, Grange Plaza (259 Grange Road East, Guelph). 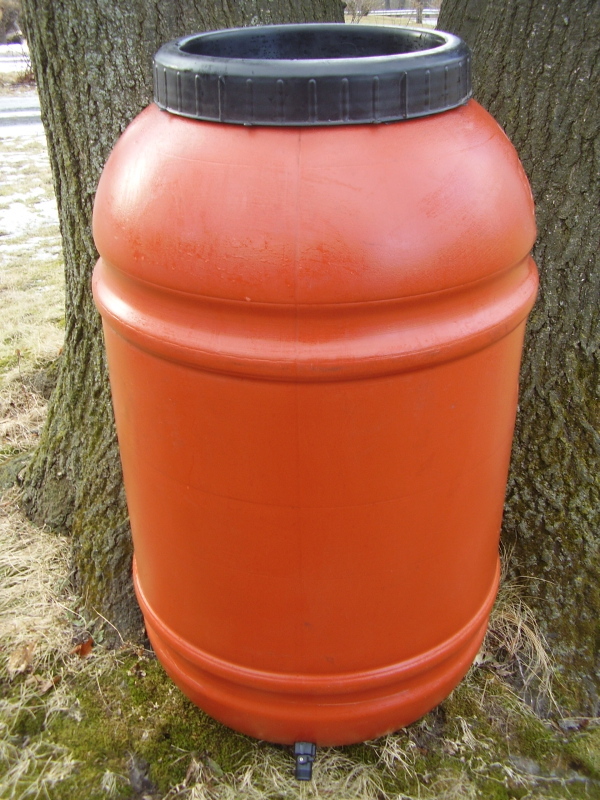 GIRC rain barrels are durable, locally made from used food import barrels and available in three colours. They are easy to maintain, repair and customize. A 220 litre rain barrel is only $60 (while supplies last, Visa and Mastercard accepted). To guarantee availability, pre-order yours now HERE. Proceeds from the rain barrel sale support the GIRC’s other initiatives, including the Guelph Festival of Moving Media taking place in November. Staff from The Elora Centre for Environmental Excellence will also be on hand at Planet Bean from 10.00 a.m. till 4.00 p.m. to provide FREE home energy advice. Non-perishable food items will also be graciously accepted for the Grange Hill East Neighbourhood Group’s food cupboard. In the second hour of the show we’ll welcome back to Royal City Rag our culture vulture, Marie Zimmerman (currently executive director of the Hillside Festival), for a relaxed chat about the arts focusing on three of the main summer festivals the area has to offer; The Guelph Contemporary Dance Festival (June 3-6), Hillside Festival (July 23-25) and Eden Mills Writers Festival (September 19). As usual we’ll wrap up the whole show with some great music. You won’t want to miss it! Royal City Rag, Saturdays 7-9 a.m. on CFRU93.3fm, Guelph’s Campus-Community Radio Station. Remember if you don’t catch Royal City Rag live on CFRU93.3fm, you can pick it up later that day via the CFRU archive or here, on the blog, the next day. Shannon Lee Stirling from Backyard Bounty joined us during the first hour of November 14 to talk about the Urban Agriculture symposium taking place at the Arboretum, University of Guelph on November 20. Urban Agriculture: Opportunities for Action will bring together the movers and shakers in the Urban Agriculture scene. The conference aims to not only inspire action but address key issues and provide connections that enable the Urban Agriculture movement to advance. The symposium is presented in partnership with Guelph-Wellington Local Food Initiative, The City of Guelph’s Healthy Landscapes project, The Organic Conference and Chris Jess‘ Food School project. Later in the first hour, we caught up with Norah Chaloner from Guelph Urban Forest Friends at The Big Umbrella community information table at the Guelph Farmers Market. The Ontario Urban Forest Council was in Guelph this past week for a very successful annual conference that focused on the importance of protecting trees during the developmental planning process. In the second hour of the show, Marie Zimmerman Royal City Rag’s culture vulture was back in the studio to chat about two summer festival related events, the Guelph Contemporary Dance Festival (GCDF) Off-site series and Hillside Inside. The GCDF Off-site series performance takes place on November 17 at noon in the University Centre Courtyard and again at 7.00 p.m., in the Alma Gallery, Wyndham Street, Downtown Guelph. Canada’s oldest modern dance company, Canada’ oldest contemporary dance troupe, Winnipeg’s Contemporary Dancers (WCD). are the featured artists. Hillside Inside, the iconic summer festival’s winter cousin taking place for the third time on Saturday February 6, 2010 at the Sleeman Centre, downtown Guelph. Performers confirmed to date include Ani DiFranco (her only Ontario appearance), Hawksley Workman, Martin Sexton, Final Fantasy, Basia Bulat, Bahamas, Woodhands and Delhi 2 Dublin. Check out the live version of Smiling Underneath by Ani DiFranco in the podcast if you missed the show. Hillside Inside will also feature local food and craft vendors and a selection of community organization booths. 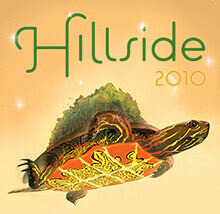 A wide range of volunteer opportunities are also available for Hillside Inside 2010. Visit www.hillsidefestival.ca for more details. Coming Up On Royal City Rag – Urban Farming, Modern Dance And Hillside! We’re welcoming Shannon Lee Stirling from Backyard Bounty back to Royal City Rag on November 14. 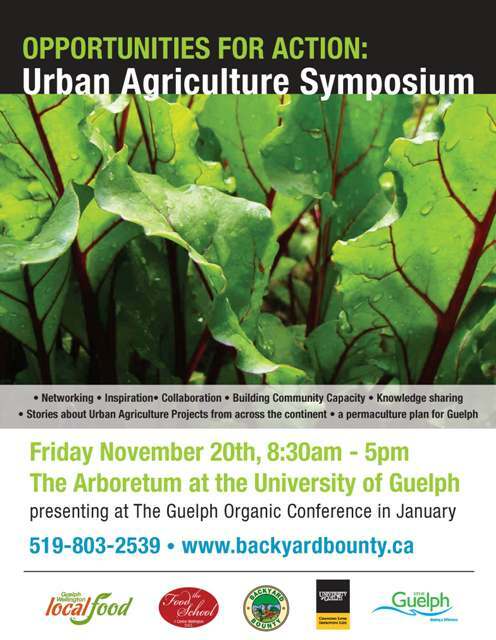 Shannon will be talking about the Urban Agriculture symposium taking place at the Arboretum, University of Guelph on November 20. In the second half of the show, Marie Zimmerman Royal City Rag’s culture vulture will be joining us with a festival update. On November 17, the Guelph Contemporary Dance Festival are having another of their Off-site series events, this time featuring Canada’s oldest modern dance company, Winnipeg’s Contemporary Dancers (WCD). The evening”s performance, “On The Road”, takes place at 7.00 p.m. in the Alma Gallery, Wyndham Street, Downtown Guelph. We’ll also be chatting about Hillside Inside, the iconic summer festival’s winter cousin taking place for the third time on Saturday February 6, 2010 at the Sleeman Centre, downtown Guelph. Performers confirmed to date include Ani DiFranco (her only Ontario appearance), Hawksley Workman, Martin Sexton, Final Fantasy, Basia Bulat, Bahamas, Woodhands and Delhi 2 Dublin. Hillside Inside will also feature local food and craft vendors and a selection of community organization booths. A wide range of volunteer opportunities are also available for Hillside Inside 2010. Visit www.hillsidefestival.ca for more details. Royal City Rag, Saturdays from 7-9 a.m. on CFRU 93.3fm. Don’t miss it!